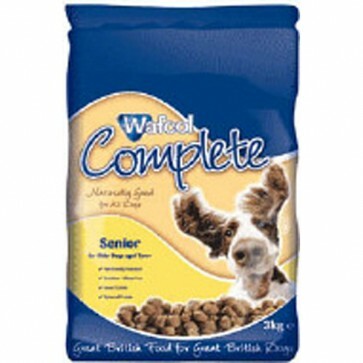 Wafcol Complete Senior Dog Food has been carefully formulated to meet all the nutritional requirements of the Senior Dog, aged 7 years or above that contains only 16% protein. Wafcol Senior is easy to digest, highly palatable and also free from barley, rye, oats and red meat, making the sensitive recipe particularly useful for senior dogs that suffer from underlying skin problems too! Wafcol Complete Senior is low in calories to prevent weight gain, but also contains one of the lowest protein levels found in a non prescription food that is available without a visit to the vet, which can help to maintain the Vital Internal Organs, such as the Kidneys & Liver, which may be under stress. Wafcol Senior also contains all the essential vitamins, minerals and oils found in wafcol's adult varieties to help ensure that your senior dog senior enjoys a comfortable, healthy life in it's twilight years.